Remember Miku 2.0? She was so hyper that she played outside but it suddenly started to rain. 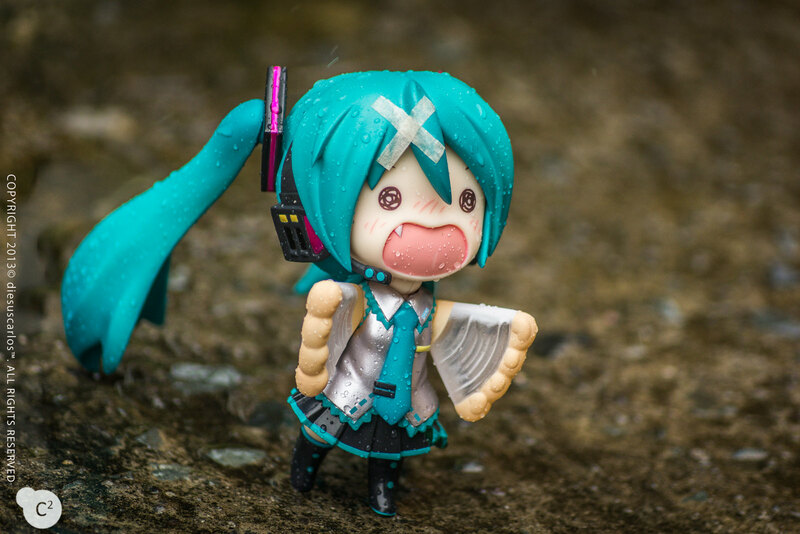 Miku 2.0: Oh no!!! I played outside for too long! I didn’t bring an umbrella with me! she finds some place to take cover from the rain. Whew. 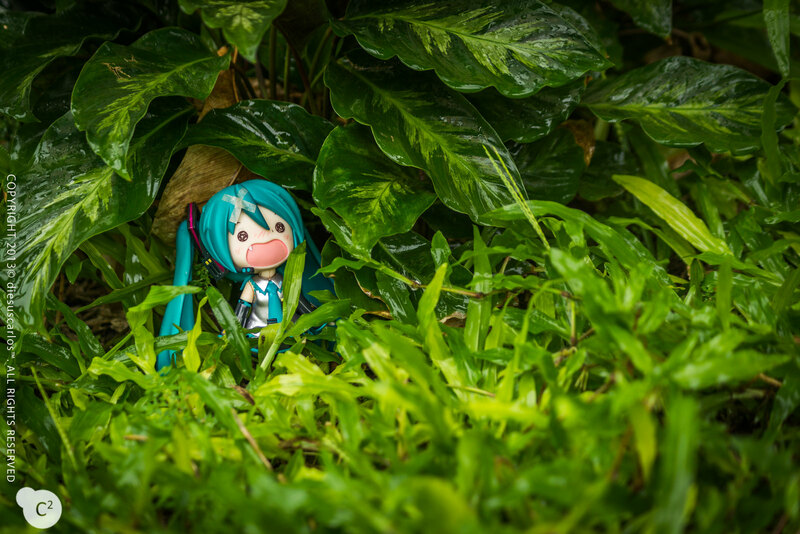 Miku 2.0 was quick to find this place! 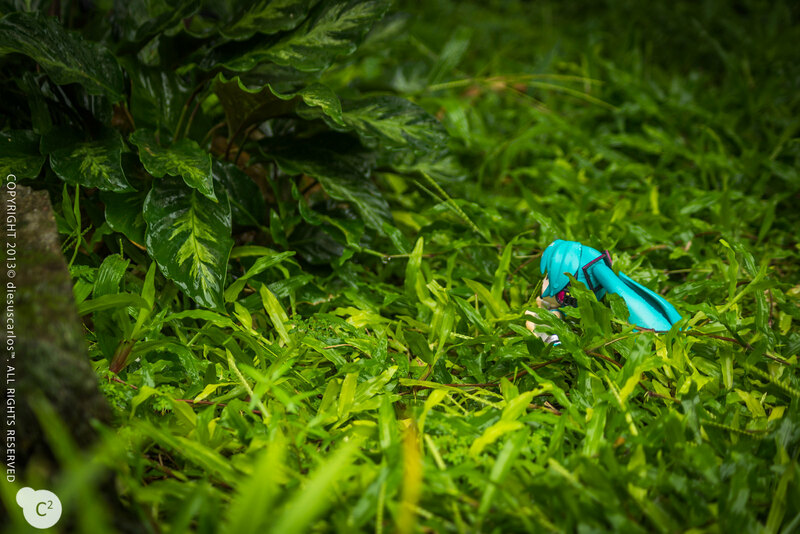 But the rain didn’t stop at all…..
Miku 2.0: ………. It’s so cold…. 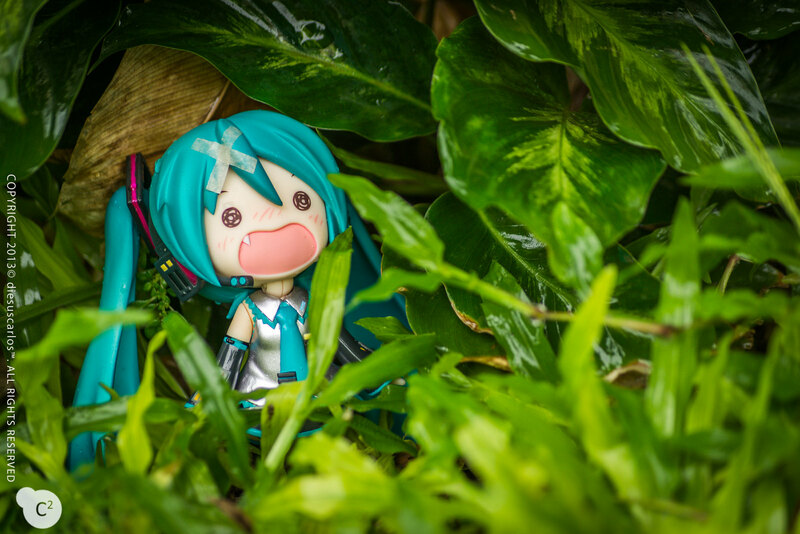 Back at home, Sakura Miku was very very worried. 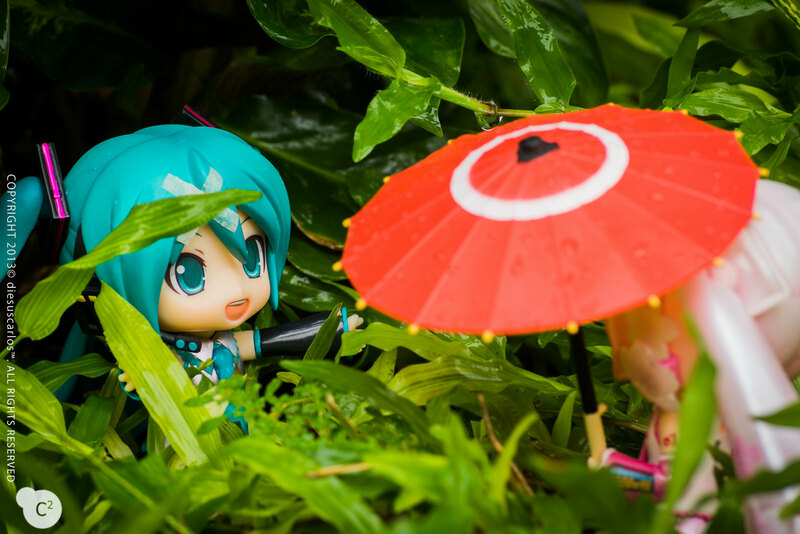 With this, Sakura Miku borrowed Yune’s umbrella and started looking for Miku 2.0-chan. 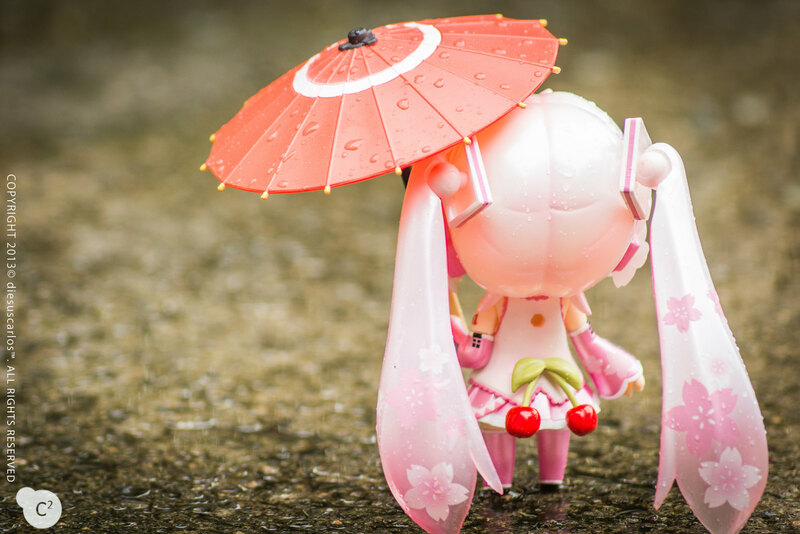 Sakura Miku: I really hope that Miku 2.0-chan is okay… I’m really getting worried now. 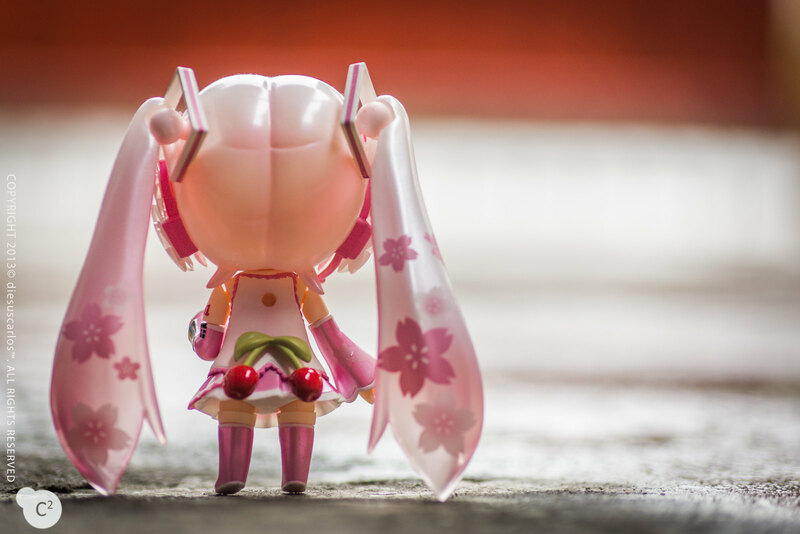 Sakura Miku didn’t give up and kept on searching for her sister…. Miku 2.0: Onee-chan! Onee-chan!! I’m over here! Onee-chan! Sakura Miku: Of course I’d come! I was too worried about you! ((*゜Д゜)ゞ” Come on! I only brought one umbrella but we can share this. Sakura Miku: Here! Use my handkerchief. 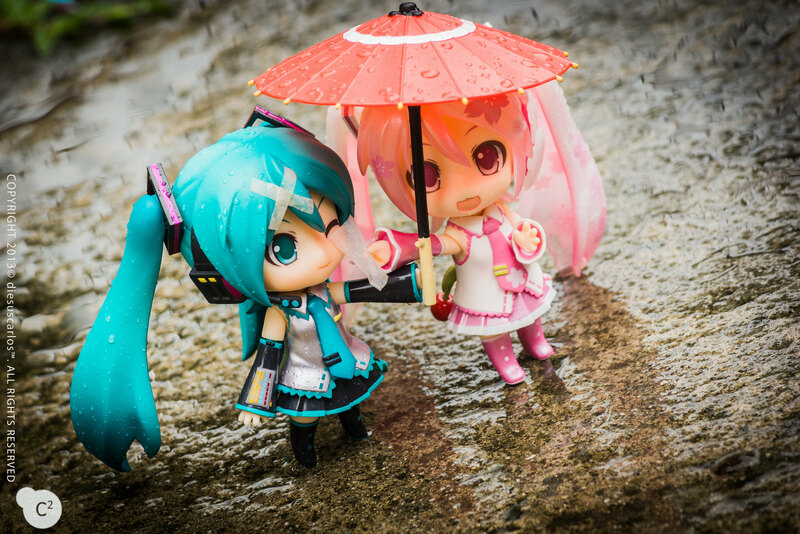 You’re too wet Miku 2.0! Posted in Figure/Doll Photos, NendoroidsTagged anime, good smile company, hatsune, hatsune miku, kawaii, miku, nendonesia, nendoroid, nendoroids, sakura miku, toy photographyBookmark the permalink. Aww, this is so cute! Great pictures!! I have a question. 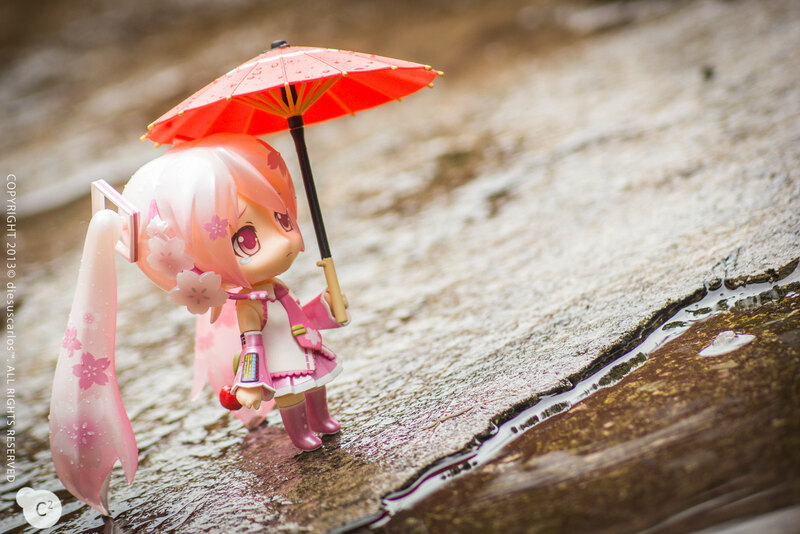 I’m planning on doing some photo shoots outside with my Nendoroids. I’ve heard they’re really durable. Do you notice much wear build up on the figure from getting them dirty or wet? Ah yes. They are very durable! The wear that you’ll notice would be some scratches. You would expect loss of color and scratches at their sole or any other parts touching the ground so be careful not to drag them when positioning them. Always lift and gently let them down before moving joints. The slightest pressure and movement may scratch their paint when they are touching rough ground. For the getting wet part, just make sure that you wipe them immediately and thoroughly after getting wet to avoid dry water marks and acid rain damage (I do this every other shot/pose, not after the shoot). I blow dry (weakest heat settings you can get) them a little to make sure the joints are dry and then refrigerate them afterwards to tighten up the parts that expanded after blow dry. How cute ^^. Agree about Miku 2.0 being hyper. I used to think that I would display her with that Petanko pose because she looked damn cute, but she’s never been displayed that way since she came here. Somehow there’s something wrong about her if she’s not looking overactive. Nendoroid Yune – A review?